Drake Ave. Dug Hill Rd. Drake Ave. Airport Rd. Madison Blvd. Wynn Green Cove Rd. Hobbs Island Rd. Johnson Rd. Gate 10 Gate 7 Triana Blvd. Patton Rd. Gate 8 From Athens From Arab Sparkman Dr. Oakwood Ave. Jordan Lane Pulaski Pike Andrew Jackson Way Rideout Rd. Zierdt Rd. Gate 9 Leeman Ferry Monte Sano Blvd. Nolen Ave. Ryland Pike Burritt Dr. Clinton Ave. Bankhead Pkwy. Hermitage Ave. Kennamer Moores Mill Chase Road Shields Road Green Mountain Rd. Old Big Cove Rd. Ditto Marina Parkway Weatherly Rd. Bailey Cove Rd. Gate 3 Redstone Rd. Carl T. Jones Dr. Gate 1 Martin Rd. Boulevard South Martin Rd. Martin Rd. Wall Triana Hwy Trademark Dr. Wall Triana Hwy Wall Triana Hwy Whitesburg Dr. Whitesburg Dr. Bob Wallace Ave. Governors West Cabela Dr. Meridian Slaughter Rd. Old Madison Pike Browns Ferry Browns Ferry Road Mill Rd. Main St. Palmer Rd. Westchester Dr. Wall Triana Hwy. Sullivan St. Balch Rd. County Line Rd. Hughes Rd. Providence Main St. Jeff Rd. Glenn Hearn Blvd. James Record Rd. MADISON Huntsville Montgomery Memphis Chattanooga Nashville Birmingham Jackson Atlanta 65 85 59 20 55 20 59 65 75 20 85 75 72 72 565 TN MS GA En te rp rise E x p l o r e r Voyager Cecil Ashburn Dr. Sutton Four Mile Post Old Hwy. 431 53 72 431 72 17 15 14 20 565 Tennessee River 19 SEE DOWNTOWN MAP SEE DOWNTOWN MAP Pratt 231 231 431 REDSTONE ARSENAL NASA Marshall Space Flight Center REDSTONE ARSENAL NASA Marshall Space Flight Center AMCOM LIMITED ACCESS AREA McMurtrie Dr. Huntsville/Madison County Convention & Visitors Bureau 500 Church Street NW, Suite One • Huntsville, AL 35801 800-SPACE-4-U • 256-533-5723 • huntsville.org Washington Washington Church AL University Dr. University Dr. ©2016-3 Huntsville/Madison County Convention & Visitors Bureau 20 California 8 Sparkman Research Park Blvd. Sparkman Research Park Blvd. 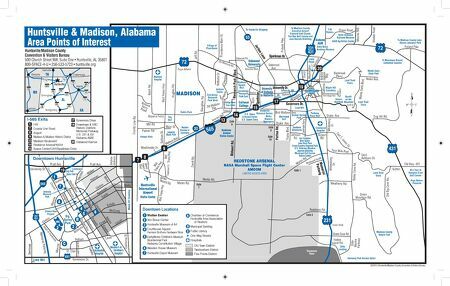 9 I-565 Exits I-65 County Line Road Airport Madison & Madison Historic District Madison Boulevard Redstone Arsenal/NASA Space Center/UAH/Sparkman Drive 8 1 7 13 14 15 17 19 20 9 Governors Drive Downtown & VBC Historic Districts Memorial Parkway U.S. 231 & 431 Alabama A&M Oakwood Avenue 7 13 Governors Dr. Holmes Ditto Landing Harmony Park Animal Safari Madison County Nature Trail Ice Complex Kids Space John Hunt Park Cross Country Running Park U.S. Veterans Museum Jaycees Building Municipal Golf Course Tennis Center Parkway Place Mall Bridge Street Town Centre Crestwood Hospital Huntsville Botanical Garden Metro Kiwanis Sportsplex Brahan Spring Park Oakwood University Calhoun College Monte Sano State Park North Alabama Railroad Museum A&M Agribition Center Maple Hill Cemetery To Madison County Lake, Sharon Johnston Park To Moontown Airport, Cathedral Caverns Redstone Arsenal Visitor Center Scenic Overlook Land Trust Trails Land Trust Trails Land Trust Trails Madison Square Mall U.S. Space & Rocket Center U.S. Space Camp Cummings Research Park West Village of Providence Jackson Center VA Clinic Cummings Research Park East Dublin Park Palmer Park Insanity Skate Park Madison Chamber of Commerce City Hall To Huntsville Dragway Burritt on the Mountain RTJ Trail @ Hampton Cove Golf Course Hays Nature Preserve To Madison County Executive Airport, Colonial Golf Course, Fox Run Golf Course and Jack Daniels Distillery Alabama A&M 3-H Stables Memorial Parkway Huntsville & Madison, Alabama Area Points of Interest Visitor Center Von Braun Center Huntsville Museum of Art Courthouse Square Harrison Brothers Hardware Store EarlyWorks Children's Museum Bicentennial Park Alabama Constitution Village Weeden House Museum Huntsville Depot Museum Downtown Locations 1 2 3 4 5 6 7 A C B Chamber of Commerce Huntsville Area Association of Realtors Municipal Building Public Library One Way Streets Hospitals Old Town District Twickenham District Five Points District Huntsville International Airport Visitor Center University of Alabama in Huntsville Southern Adventures Merrimack Hall Lowe Mill State Black Archives Museum Lowry House Bradford Oakwood Rd. Old Monrovia Rd. Adventist Blvd. Madison Hospital Spragins Big Spring Park Lowe Mill Adams Maple Hill Cemetery Walker Cleveland Holmes Clinton Clinton Randolph Echols Gates Locust Eustis McClung White Monroe Monroe Church Washington Washington Meridian Jefferson Jefferson Green Greene Greene Lincoln Willliams Willliams Memorial Parkway Heart of Huntsville Lowe Gallatin Seminole Madison Franklin Cruse California St. Andrew Jackson Fountain Row Fountain Row Pratt Ave. Pratt Ave. Wells University Dr. 3 VBC 2 Huntsville Hospital Women's & Children's Hospital 565 231 431 431 B 7 A 5 4 6 1 19 Downtown Huntsville Church C Skate Park Dog Park Lumberyard Veterans Memorial Park Clinton Row Project Campus No. 805 St. Clair Pelham Governors Dr. Dr. Joesph E. Lowery Blvd.